Convoluted egg crate packaging foam is a multi-functional product with interlocking peaks and valleys which encapsulate products, reducing movement during shipping. 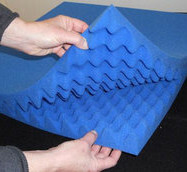 Convoluted Packaging Foam is manufactured from polyurethane foam in an “egg crate” design, providing an increased surface area and giving you better cushioning. The material is flexible and easy to cut. Convoluted Packaging Foam is a cost effective solution for shipping.